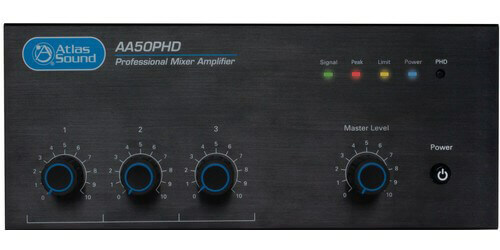 The Atlas Sound AA50PHD is a mixer amplifier that can output 50 watts of power to your 25V, 70.7V, or 4 ohm speaker system. The AA50PHD is ideal for conference room presentation audio, and commercial paging and background music. 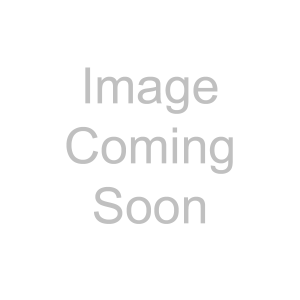 The mixer/amp features one microphone or line input and two stereo line inputs, it is an ideal solution for a vast range of input sources such as paging microphones, media players, and digital music receivers. 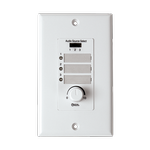 Connect to the optionally purchased WPD-RISRL and you now have a remote wall plate that works up to 200' away from your amplifier, this wall plate allows you to select your input and adjust the volume. 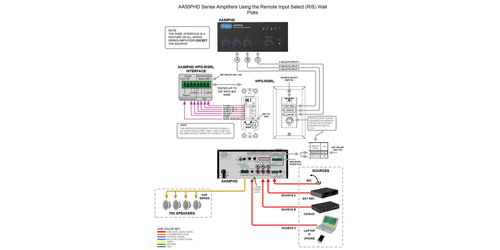 What is unique to the AAPHD mixer amps from Atlas Sound is that they have push to touch diagnostics by checking the connected speaker lines for wiring and impedance errors, this makes setting up and troubleshooting easier than ever. 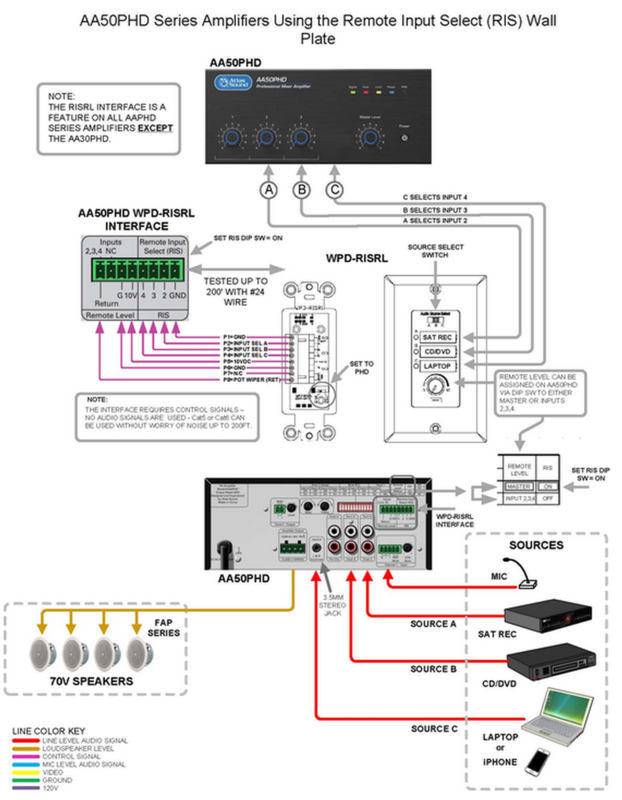 This test can be activated once all speakers are connected and the circuit automatically verifies that the attached speakers' tap settings do not exceed the amplifier's rated power, no speakers are mistakenly tapped at 8ohm, and the speaker wire is free from shorts. 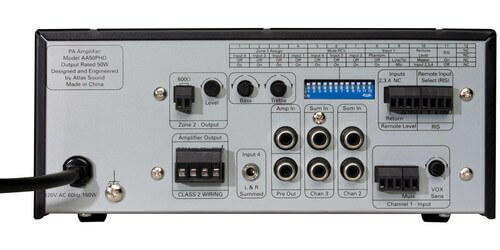 Additional features include a rear panel DIP switch that allows for creation of Zone 2 output using either input 1, 2, 3, or input 4. 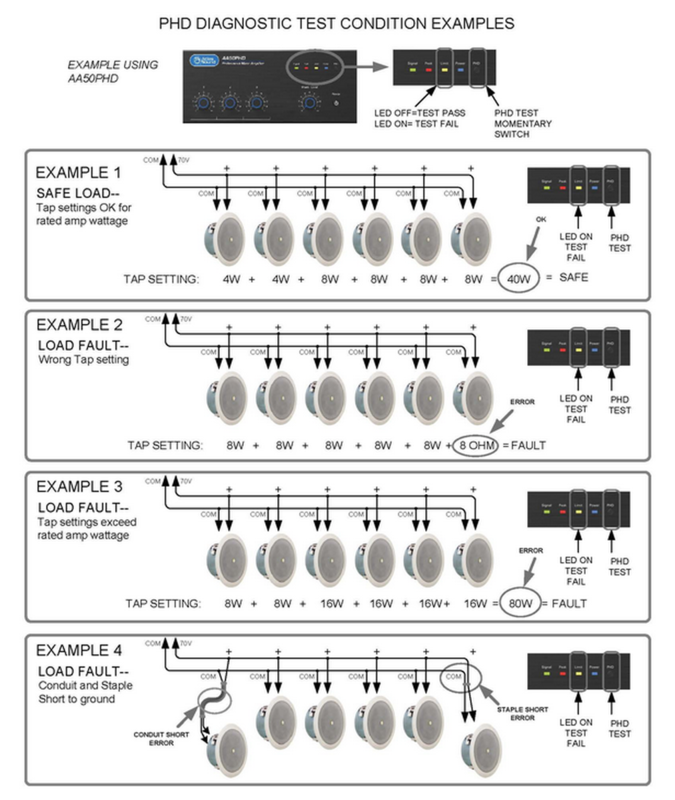 The unit can also be set-up to mute inputs 2, 3 and 4 based on signal from input 1 for paging applications where other input sources need to be muted during a page. Input 1 is either Mic or Line input selectable and phantom power is an option when using input 1 Mic input. 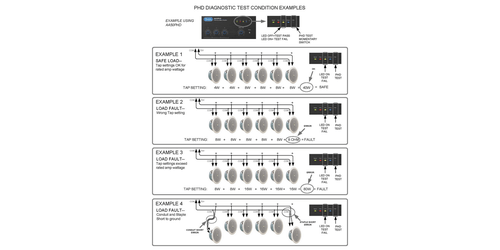 The AA50PHD from Atlas Sound has numerous features with reliable power, with push to test diagnostics you can't go wrong.